There is nothing more discouraging than investing quite a bit of time into work and then seeing it compromised by the lack of physical protection. As business owners, Access Technologies knows the value of warranted assurance, safety and peace of mind. We are proud to offer clients our Physical Security Technology of video surveillance so you, too, can share the peace of mind that comes with our complete security solution. What exactly are the benefits of entrusting your security to the video surveillance system provided by Access Technologies? Our digital video surveillance features countless benefits like high-quality and HD video, significant bandwidth and storage efficiency, 24/7 video and audio recording, remote monitoring capability, automatic archiving and more. With this service you also have access to a video consultant who can walk you through system configuration and help you analyze your specific security needs to best monitor your business. At Access Technologies, we know that security is a top priority for business owners. Let us provide you with the solutions that you need to ensure your facility’s and employees’ safety, 24 hours a day. Are you ready to upgrade your company’s entire security network? 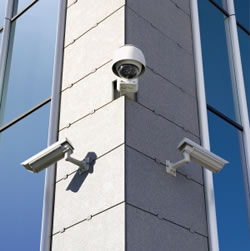 Contact our professionals today to learn more about our Physical Security Technology.